Justice Secretary Menardo Guevarra who is now assigned as the country's officer-in-charge while Pres. Duterte is on official state visit to Israel and Jordan burned down veteran journalist Karen Davila on her own show regarding the Trillanes amnesty revocation issue. During the exclusive interview with DOJ Secretary Menardo Guevarra, explained clearly the real issue about the declaration of Sen. Trillanes' amnesty as void from the very beginning. 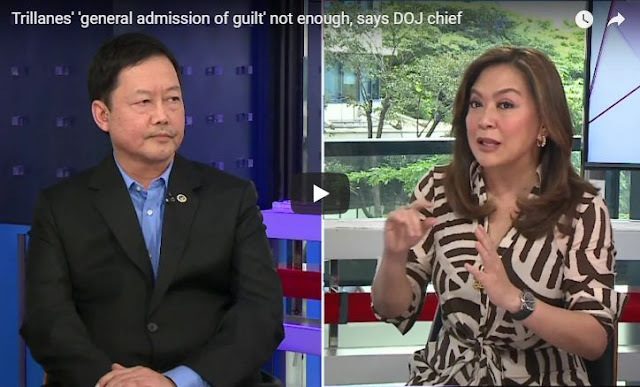 Karen Davila asked Secretary Guevarra about the specific issue on what did Sen. Trillanes failed to apply and what was the failure in the process. Sec. Guevarra explained by saying "The proclamation itself states very clearly, what minimum requirements were not meet by Sen. Trillanes, more specifically, the personal filing of an official amnesty application form under oath, and an express expression of guilt for the offenses charged against him." Guevarra stated. When Karen Davila insisted that Sen. Trillanes showed a video of the alleged filing of the amnesty, but the records could not be found according to the DOJ as stated by the proclamation of Pres. Duterte. Karen Davila seems to defend Trillanes during the interview but she was burned down by the Justice Secretary who informed Davila that Sen. Trillanes IV should not only make a "specific admission" of guilt but also retract any public statements he may have made before in order for the amnesty to be valid, the secretary of the Department of Justice said Wednesday.